Adnan Oktar, whose pseudonym is Harun Yahya, is an Islamic fundamentalist author/activist with fervent creationist views. Oktar is the head of a prominent creationist organization, the Scientific Research Foundation (Bilim Arastırma Vakif—BAV), and was recenty entangled in a criminal court case as a result of his political activities. Oktar and BAV have been making headlines for sometime in the Turkish press, but his efforts to take advantage of a new law passed in November making it possible for individuals to petition to close websites have gained the attention of the international press. The court case against the Islamist occurred in the heat of the closure case launched against AKP for allegedly being a center of anti-secular activities, and while no doubt politically inspired, fell amidst Oktar's own political machinations, especially his zealous attempts to limit freedom of expression. Oktar's most famous target is Richard Dawkins, whose website he successfully petitioned to have shut down in September. Since that time, he has successfully shutdown other sites, including the newspaper Vatan and that of the Education Personnel Union. One of the first websites Oktar had shut down was the popular website Ekşi Sozluk, a type of urban dictionary replete with sour humor. Accusing the site of libel, his petition was granted and access to the site restricted by Türk Telekom. His publications have a broad readership throughout the Muslim world, where he is well-known for his anti-evolutionist views, and his publishing house is devoted almost exclusively to the issue. Oktar (Yahya) recently appeared in The Guardian, which featured an interesting, but none too flattering profile in a larger story about the evolution debates. As a Texan, it is particularly amusing to read he has ties with a bizarre creationist organization in Dallas, Texas. But ideas do not die, they spread and mutate. Creationism might be on the back foot in America, but it is blossoming elsewhere as Richard Dawkins discovered when Turkish readers told him they could no longer access his website. 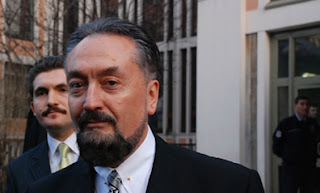 Dawkins's offence was to satirise Harun Yahya, the pen name of Adnan Oktar, the front man for a wealthy Islamic publishing house. Its lavishly illustrated Atlas of Creation spends 500 pages comparing fossils with present-day species to argue that evolution never took place. Dawkins looked at a picture of an ancient fossilised eel and a picture of what Yahya claimed was a modern eel and pointed out that it was in fact a sea snake. Yahya went on to represent the immutability of God's creation by claiming that a fossilised insect had survived unchanged for millions of years. Unfortunately, the modern version of the caddis fly Yahya chose to illustrate his point was not a fly at all, but a steel fish-hook with a fake insect on top to lure fish on to the line. Westerners say that Yahya reminds them of American creationists. The link is more solid than they know. In Atlas of Creation, Yahya acknowledges his debt to Duane Gish from the Institute for Creation Research in Texas. Gish has spent years arguing that the fossil record contains no evidence of species evolving and blustering whenever a palaeontologist contradicted him. As a Muslim, Yahya did not need to accept the institute's Protestant fundamentalist 'young-Earth' doctrine - the notion that God made the world in 4004BC or thereabouts. But he happily borrowed Gish's equally idiotic delusion that today's species cannot have evolved and must therefore be identical to their ancestors of tens or hundreds of millions of years ago. Vast sums of probably Saudi money are fuelling the move of creationism across the Atlantic. In Turkey and the Middle East, poor schools are grateful for Yahya's free books and scientists are becoming frightened of speaking out. Last year, the Council of Europe warned that Yahya was also targeting schools in France, Belgium, Spain and Switzerland. In Britain, academics talk of expelling mainly Muslim science students. They do not make a fuss about it in case post-modern relativists in the mould of Steve Fuller accuse them of religious discrimination, but say, very quietly, that if religion stops their students accepting evolution, there is no point in them staying at university. Maybe in a generation's time, Americans will patronise Europeans as quasi-fascist bigots. If we are to avoid their condescension, we must accept that creationism will not go down with the American conservative movement. It is evolving and its opponents must evolve, too, if they want to defeat it. Interestingly, to some degree, Oktar's views may be moderating, as he recently expressed told a group of a reporters a few weeks ago that Muslims can believe in evolution, and still be good Muslims. There are plenty of evolutionists in the United States who do not apply the same attitude toward Christianity. Turkish officials have admitted problems with the law’s enactment, but defend its intent. ‘The fight against elements that aim at degenerating societies and poisoning the youth and children is the fundamental task of each country. Every country has different regulations related to the Internet,’ transportation minister Binali Yildirim, who is also responsible for communications, recently said. ‘Our aim is not to ban websites. Such measures will come to an end as soon as our courts are able to ban problematic content instead of entire websites,’ he said. But critics like Yaman Akdeniz, a professor of law at the University of Leeds and director of Cyber-Rights.Org, believe Turkey’s Internet law is too flawed to be salvaged and would most likely not stand up to a legal challenge at the European Court of Human Rights, whose judgments are binding on Turkey. ‘The current law should be abolished and the government should start from scratch when it comes to controlling the Internet,’ he says. Mustafa Akgul says without a new approach, Turkey may find itself increasingly left behind when it comes to utilising the power of the Internet. ‘Turkish politicians haven’t had any real vision on how to develop the Internet. There are more people working on censoring it than developing it,’ he says.